GameStop is clearing out their used console inventory and is offering the Nintendo Wii U 32GB console at its lowest ever price of only $99.99. Shipping is free. Note this is a GameStop "Premium Refurbished" and conditions may vary. If you prefer a pre-owned unit vs GameStop refurb, they also have them on tap for $99 as well. The average price for this deal since released is $213.57. Lowest historic price was $99.99 on Nov 24, 2018 at GameStop. Well, the Wii U is now decisively under $150. At a new historic low price of $120 - this factory refurbished Wii U is a tempting deal for select gamers. Nintendo is once again offering up refurbished Wii U for only $200 flat. Comes with full 1-year warranty given this is sold by Nintendo's eBay shop. Factory refurbished with free shipping (if you buy from Nintendo's online store instead, you'll have to deal with shipping). Refurbished Wii U going for two hundred bucks. Comes bundled with Nintendo Land plus $25 gift card. Shipping is free and sales tax in most states. One year full warranty from Nintendo since this is manufacturer refurbished. Flash sale coupon at eBay means cheap Nintendo hardware. Wii U factory refurbished 32GB model is on sale for $185. Full 1 year warranty straight from Nintendo. Free shipping. Deal ends soon tonight at 8PM Pacific. Nintendo's eBay Store has this refurbished WIi U console at its historic low after flash coupon. Last time we saw it this cheap was only for a few hours back in January of this year. The average price for this deal since released is $249.04. Lowest historic price was $89.99 on Oct 13, 2015 at CowBoom. Pre-owned units of Wii U 32GB deluxe console going for as low as $90 at CowBoom. Must log in to account to use the discount code. If you don't care about scratches/cosmetic issues on your machine, this is a good way to save some cash. Looking for the cheapest Wii U? Today CowBoom (subsidiary of Best Buy) is selling pre-owned 32GB Consoles for $159.99 after an $80 off coupon code. Lowest price ever seen by $20. Pre-owned 32GB deluxe Wii U console drops to $180 at CowBoom (Best Buy subsidiary) today. That's $119 off buying one in new condition and $50 off buying in refurbished version. Wii U Console 32GB Deluxe cut down to $260 with free ship on Rakuten's eBay page. Every time it hits this price range it sells out quickly, so I doubt this will last as long as the set expiration date of Monday, September 15th at 8am Pacific. Will move fast. Wii U Console 32GB Deluxe Set with New Super Mario Bros U and New Super Luigi U is back at a discount on Rakuten's eBay page to $260, free ship. Typically when this set hits this price points its only a matter of minutes before sold out. The average price for this deal since released is $175.22. Lowest historic price was $59.99 on Oct 12, 2018 at GameStop. Best price for Nintendo Wii console bundle with Sports Resort and MotionPlus is $169.99 at both Amazon and Buy.com, but Buy.com is throwing in two extra games. Bought separately this combo would usually cost $250. Today's the day to buy a Wii. Amazon is throwing in a $50 bonus credit with the newest white bundle for $199.99, or you can get the black bundle for $177. Newest Nintendo Wii white bundle..with the MotionPlus built into the controller, instead of as an attachment. Amazon is throwing in a $50 bonus credit that you can use for future gaming purchases. Better than any Black Friday deal we've heard of. The average price for this deal since released is $139.99. Lowest historic price was $49.99 on Oct 12, 2018 at GameStop. But isn't Nintendo planning on dropping Wii's price down to $199.99 on 10/01/09 anyway? Yay for the price drop! Here's something we haven't seen in a number of years. GameStop is clearing out inventory of their used Wii U with both the 8GB and 32GB systems on tap. The 8GB model is only $100 while the 32GB Deluxe Black system is $120. The average price for this deal since released is $266.05. Lowest historic price was $99.99 on Sep 19, 2018 at GameStop. The basic 8GB Wii U console dropped from $299.99 to $239.99 at Target today, making one of the first significant price drops we've seen thus far. Amazon is $279, but elsewhere it's still at the original $300 price. New low on the basic 8GB Wii U console without any gimmicks or gift cards from Best Buy today. This deal'll end tomorrow, and elsewhere you'll spend at least $30 more. The Nintendo Wii U basic set comes with a $20 Gift Card this week at Best Buy. Quite a few Wii U games have dropped in price lately so that GC will come in handy. Best Buy has the Wii U Console 8GB Set with Nintendo Land for only $300. It will cost you around $340 when you buy separately, with the well-liked Nintendo Land already at $40-$60. Wii U available for order on Target's website at actual $299.99 list price (as opposed to the $330-$350 people are selling for on ebay and Amazon marketplace). Says "allow for extra processing time" but checkout shows delivery estimate of about two weeks. Listed as refurbished in Good condition with 12 months warranty. Classic Nintendo Wii for $40 anyone? Refurbs now only $40 at GameStop which is cheaper than they're selling pre-owned units. Online only offer (not available for store pickup). The Nintendo Wii Blast from the Past Bundle for $60 is back at GameStop this Week. Includes a copy of Super Mario Galaxy, Wii Sports and New Super Mario Bros. Nothin' fancy, but a classic system. The average price for this deal since released is $58.52. Lowest historic price was $29.99 on Jul 12, 2016 at GameStop. The old school Nintendo Wii pre-owned console with free copies of Super Mario Galaxy and Wii Sports now only $50 at GameStop. This bundle with 2 free games is the same price GameStop is charging for a pre-owned Wii Console alone. Nintendo Wii Console down to a mere $30 after rebate at GameStop. The rebate comes printed on your packing slip and is entered in here online. Does this offer come with some kind of warranty? You can grab a pre-owned Nintendo Wii console for only $40 with free shipping at Cowboom, today only. These days refurbished Wii consoles go for about $120 and new ones around $200. It's way past its prime but today you can grab a pre-owned Nintendo Wii for only $40 with free shipping at CowBoom. These days refurbished Wii consoles go for about $80 at GameStop and new ones around $130. The average price for this deal since released is $194.99. Lowest historic price was $139.99 on Jan 12, 2018 at GameStop. 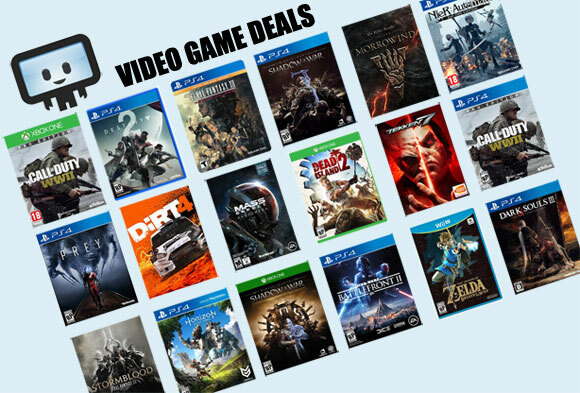 Can't find any Wii U Cyber Monday deals? We can't either. One of the better picking is this "Blast from Past" bundle at GameStop for $189.99. Comes with Super Mario 3D World and Shovel Knight. Nintendo Wii is a one-of-a-kind entertainment system that is fun for people of all ages. Many people who have Xbox 360 or PS3 game systems also buy Nintendo Wii systems because the Wii is so different.